This recipe I m writing by request of my Instagram friends, they saw it and contacted me for the recipe. 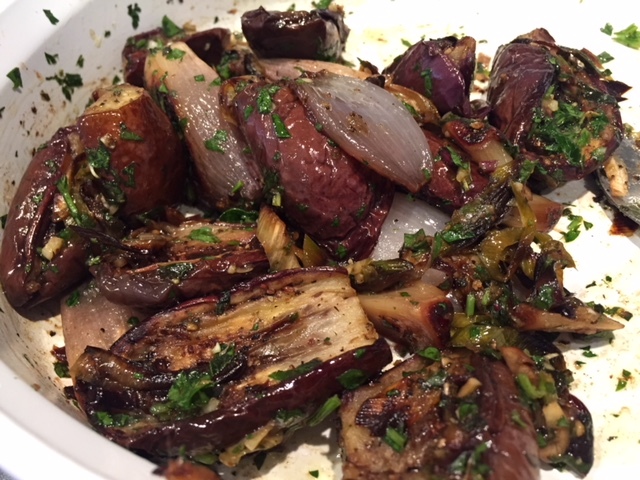 But I decided to share it specifically because of my Asian friend named An Hoang who was once my hair stylist at Aveda Institute and she does all kind of amazing Vietnamese recipes but she said she is not used to cook eggplant or know how to do Mediterranean food. That is my specialty and it is no natural that I don’t need to look for recipes, it all in my brain, my Italian genes cannot deny ! So for this recipe the goal was to used for pizza topping and later to became a salad. The onions and shallots are both members of the allium family. 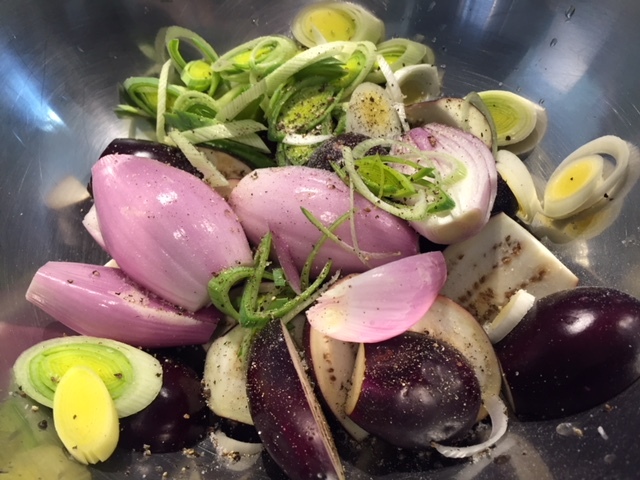 Shallots have a sweet and mild flavor and as much people like to eat it raw I rather eat it roasted or stir fry, it is the best! Also last week because was Lunar Chinese New year I went to an Asian Market in Winnipeg to get treats for my patients. I found there the Indian Eggplant that you can’t find in regular markets. They re juicy and smaller , you should look for dark reddish-purple in color, these are pickled, cooked in curries, soups, and stews. 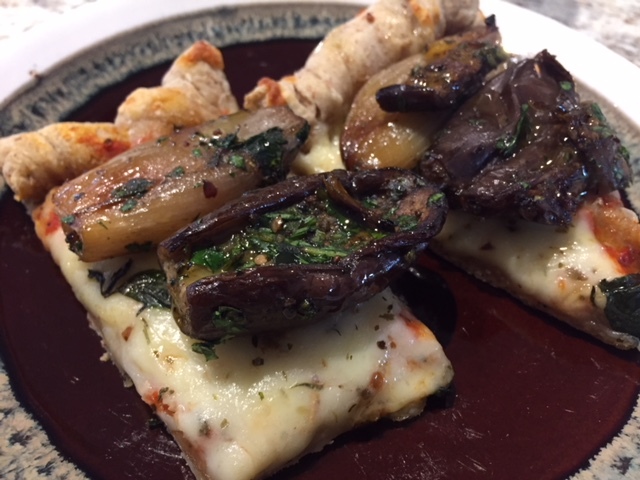 If you google ” Indian Eggplant” you will see hundreds of recipes of a Punjabi Eggplant (Baingan Bharta) Recipe version… but this one I guarantee is 100% Italian inspired! Pre heat your oven to 350 F, get a tray and put parchment paper on top. Get aluminium foil and cut to tip top of the head of a whole garlic, sprinkle 1 tea spoon of salt Chipotle chiles powder, balsamic vinegar and olive oil. 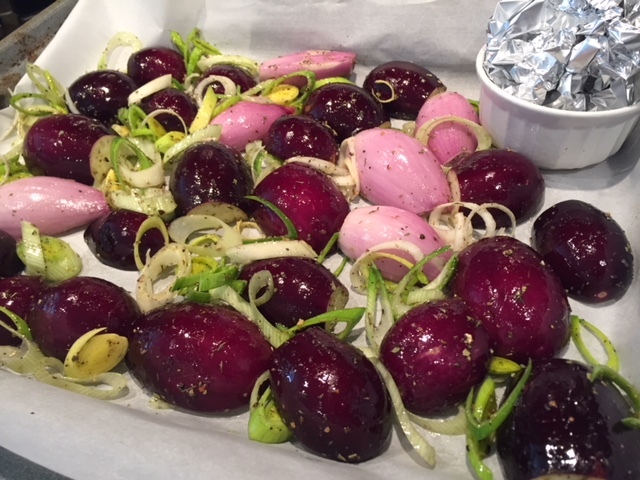 wrap to garlic sitting on the foil and to on the tray. I normally put inside a ceramic container to sit straight. 1 table spoon of kosher salt ,1/2 table spoon of ground pepper ,1 tea spoon of Greek oregano ,1 tea spoon of dried Italian herbs and 1/2 tea spoon of cumin powder. mix well to get so the veggies can assimilate the marinate. Than put in the tray with the eggplant facing down. Cook into 350 F for one hour. 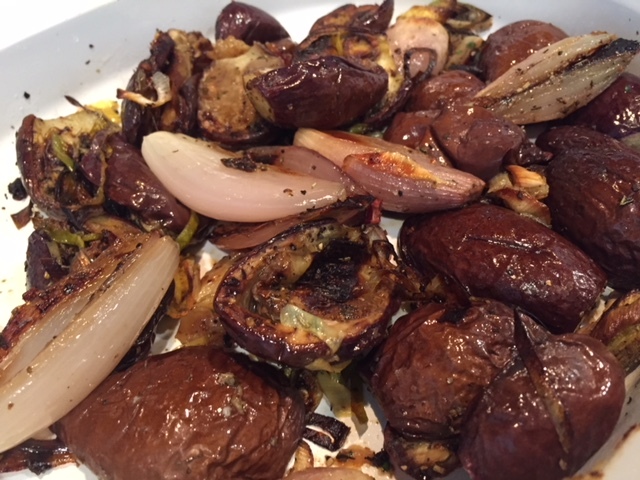 Remove from oven, get that whole garlic wrapped on paper and squeeze the garlic juice into the roasted eggplants and mix gently than wait to be room temperature than mix the 1 raw garlic chopped small and the parsley. Please storage in the fridge up to 7 days. Enjoy!